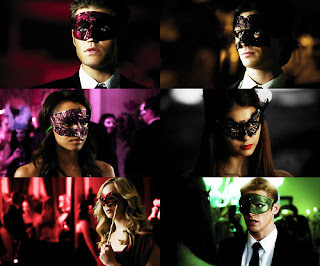 SNEAK PEEK: "The Vampire Diaries: Masquerade"
"...'Stefan' and 'Damon' decide on a new plan to deal with 'Katherine' at the 'Lockwood' 'Masquerade Ball'. "Katherine invites an old friend 'Lucy' to attend the ball with her. 'Bonnie', 'Jeremy' and 'Alaric' all do what they can to help 'Stefan' and 'Damon', but Katherine has planned a surprise that none of them could foresee. "Then things take an ugly turn when 'Matt' and 'Tyler' start doing shots with their friends..."